Less than four hours from New York, the Dominican Republic is the perfect tropical paradise getaway, where the beaches never disappoint and the warm aquamarine Caribbean waters set a spectacular backdrop to the romantic and tranquil setting it is so well known for. From the popular resorts of Punta Cana to the chic luxury of Casa de Campo, the DR offers a myriad of magnificent resorts and recreation options. But it is also a place of intriguing history, the core of this diverse country’s rich culture that many people are unfamiliar with. Founded in 1498 by Christopher Columbus’ brother, Bartholomew, Santo Domingo is not only the soul and capital of the Dominican Republic but the oldest city of the New World. The Ciudad Colonial, a UNESCO World Heritage Site, is the historic center of town and its cobblestone streets and beautifully restored mansions and fortress take visitors on a trip through time, celebrating all aspects of Dominican life along the way. 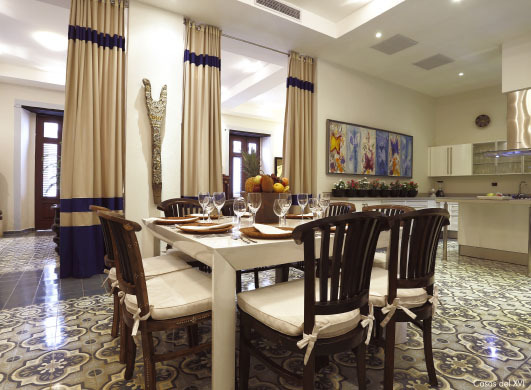 The past and present coexist rather gracefully here, which is even more evident at Casas del XVI, a superb collection of 16th-century houses in the heart of Santo Domingo’s Colonial Zone. 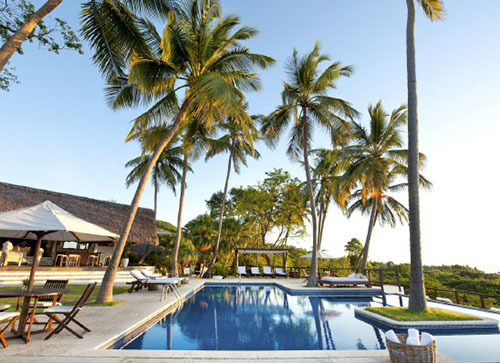 Perfectly situated to explore the vibrant city, this new luxury resort which has exciting expansion plans in the works, is comprised of two beautifully restored and authentic 16th-century houses, Casa de los Mapas and Casa del Arbol. 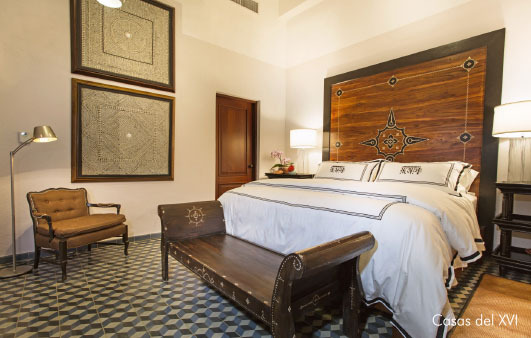 Each house remains true to its original architecture and each decorated in its own authentic way to reflect its individual theme showcasing the area’s historical and cultural beauty through its impeccable collection of local art, ancient Dominican artifacts and beautifully carved wood furniture. Adorned with palm trees, ferns and flowers, Casas del XVI transports guests to the bygone colonial era while maintaining the charm and comfort of a home away from home with all the modern amenities of a five-star boutique hotel. In true luxe style, each of the seven lavish guest rooms include a personal butler and high-tech amenities for the perfect balance between historic and modern. Spend your day at Casa de los Mapas lazing by the pool tasting the best rums of the region accompanied by a cigar or brush up on some history in the cozy library. Afterwards, take a walking tour exploring the maze of streets that reveal a wealth of historic treasures and delightful restaurants. Be sure to stay into the evening hours to check out some of the local bars, from trendy hangouts to the more bustling nightclubs that host some of the best merengue and salsa bands around. If all the dancing and sightseeing have tired you out, experience the true geographical diversity of this marvelous country by venturing a few hours farther west to discover the majestic and unspoiled beauty of the quaint village of Barahona. 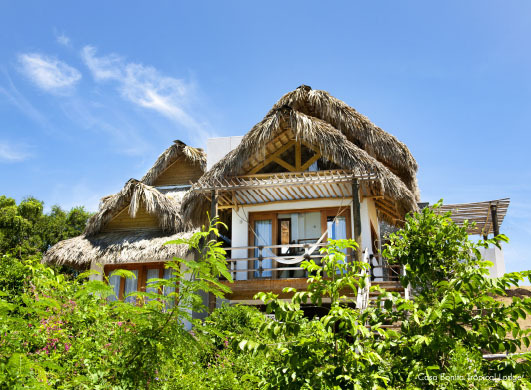 The destination here is the casual yet elegant Casa Bonita, a luxury eco lodge set next to the highlands of the Bahoruco National Park. At Casa Bonita, you become one with your surroundings, where the appreciation for the region’s flora and fauna fused with the spectacular panoramic views of the Caribbean Sea below create an ambiance of harmony and balance unlike any other. This family-owned intimate sanctuary has some of the friendliest and most hospitable staff that tend to your every need. A tropical paradise where health and well-being are paramount, Casa Bonita features a sumptuous spa offering outdoor exfoliating massages on the riverbed. Adventure seekers can go ziplining on-site, hiking in the forest to Cueva de la Virgen, or head down to the below Bahoruco Beach to surf some of the largest waves in the area. Regardless of your day’s activities you will be ready to unwind around the infinity pool for sunset cocktails before heading to an al fresco dinner featuring a gastronomic delight of organic Caribbean fusion cuisine where the ingredients are collected from the hotel’s own gardens and farm. The fusion of tropical flavors and natural bliss while taking in the cool Caribbean breeze and awe-inspiring views is a perfect ending to a day of health and adventure.